Thanks for stopping by my Atari Collector website. 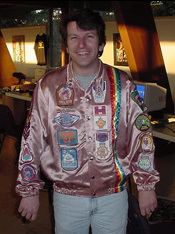 My name is Rick Weis, an organizer of the Portland Retro Gaming Expo. I'm also an Atari 2600 (VCS) Collector. I began playing video games in January of 1978 on the Atari 2600, but I had been gaming at video arcades prior. Basically I've been collecting various items for the Atari 2600 now for over 39+ years. I was 14 when I started back in 1977. Check out my collection page to see what's in my collection. For those wondering I do collect for other gaming systems but not as much as the Atari 2600. I mostly collect good games on other system that I like to play. The classic games that solidified my love for video gaming at an early age were "Adventure" on the Atari 2600 and "Super Mario Brothers 3" on the Nintendo Entertainment System (NES). However it's the Atari 2600 that I truly collect for, owning less than 10 carts shy of a complete 2600 collection. Do you have something that I'm missing? Check out my want list and let me know. Atari was able to attract the best and the brightest... It was such an exciting thing. In addition to retro Atari 2600 games, I also play the Nintendo Wii and the Microsoft Xbox 360, logging an average of 25 hours of gameplay a week. Be sure to take a look at my photo gallery. New pictures will be added as time permits. Thanks again for checking out my website. The 11th annual PRGE Expo will be held October 21-23, 2016 at the Oregon Convention Center. For more information be sure to check out the Portland Retro Gaming Expo website. So what is the Portland Retro Gaming Expo? The Portland Retro Gaming Expo is an annual convention to support the hobby of classic video game collecting. PRGE aims to recognize the history of home video game systems and their authors, manufacturers and players. Loosely defined, a classic is any video game system prior to the most recently released by any manufacturer. By this definition the Nintendo Gamecube, original XBox and Playstation 2 have recently moved into the classic realm (replaced by the Wii, XBox 360 and Playstation 3 respectively). That said, the classic gaming hobby is most closely associated with the Atari 2600/5200/7800, Nintendo NES and SNES systems, Sega Master System/Genesis, Vectrex and other systems released in the 1980s and early 1990s. We have also seen a growing interest in games for classic computer systems from Commodore, Apple, Atari 8-bit, Texas Instruments (TI), Tandy and others.